Must not forget to commit suicide. Or at least, some way of unmaking the I, some way of not suffering. Of not feeling. Above all of not feeling. Ten years later she died from an overdose of barbiturates. In the intervening decade Pizarnik wrote most of her best poems, publishing some of them in the collections Árbol de Diana (Diana’s Tree, 1962), El infierno musical (A Musical Hell, 1971), and La condesa sangrienta (The Bloody Countess, 1971), among others, and leaving behind a trove of works in progress. It was a period of high poetic productivity and inner turmoil, personal drama and black humor, and it is from these years that New Directions drew for Extracting the Stone of Madness, the first full-length collection of Pizarnik’s poems to appear in English. Pizarnik herself might well have chosen a metaphor from surgery or unrequited love, something to capture what were for her the very high stakes of composition. She was known for working long and obsessively on a little chalkboard, typically on a single poem at a time, exhausting its possibilities before moving on, erasing a word one day, replacing it the next, rearranging the lines (about a dozen at most, presumably all that would fit on the slate) of her small, lapidary poems with an obsessive care that has been obscured by their obvious debts to surrealism and automatic writing. The influence of André Breton, Paul Éluard, Henri Michaux, and Yves Bonnefoy, whose work Pizarnik translated into Spanish, can be seen everywhere in her work, but her attention to prosody and her precision set her apart from these men with whom she is often lumped. ¿Qué se dan entre sí las sombras? No one comes. This shadow. What is it that shadows give each other? Even if you don’t understand Spanish, try reading it aloud. Likewise, vibrate along with the lines of “La verdad de esta vieja pared” (“The Truth About this Old Wall”), from the same period as “En un lugar para huirse,” with its puns and confusions of meaning and sound oscillating like a plucked string between two points of understanding, the note itself invisible somewhere in between. At her best, Pizarnik reveals an ecstasy in the instability of language and draws from it a mercurial, pathetic truth. It is tempting to refer to the poems collected in Extracting the Stone of Madness as Pizarnik’s “mature” work, her finest poems written in the last decade of her life. But that judgment would do a disservice to her peculiar aesthetic. An ineradicable element of childishness persists in her later works and even those that are obsessed with death and dying, and not just in surreal, imagistic playfulness. Her constrained repertoire of images and themes are the dreamworld of a child and bristle with the urgency of adolescence: dolls and mothers, young girls and flowers, the failed dialogue of a screeching wind, mirrors, the magical strangeness of ordinary words, leaking walls, faces and names, the striking sensation of self-recognition, as if for the first time. If you spend a day with this collection, you cannot help but come away with a sense, to paraphrase César Aira, of exhaustion: not necessarily physical, but rather linguistic and poetic exhaustion, which in Pizarnik’s writing is all the more serious. “A very demanding game,” as Aira put it. And yet, unlike most modern and postmodern literary diversions, including those of Aira and Cortázar, Pizarnik’s game flows from and enacts a dead serious, deep human necessity — more ōllamaliztli than basketball. Y nadie comprende. Toda mi vida te espera. Y sin embargo busca la noche del poema. Solamente pienso en tu cuerpo pero rehago el cuerpo de mi poema como quien trata de curarse una herida. And no one understands. All my life waits for you. And nevertheless, I search for the night of the poem. I only think of your body but I redo the body of my poem like someone who tries to cure her own wound. The very demanding problem of human connection is not only represented but also reenacted in the entwining of a shifting, untrustworthy language with disconsolate human longing. And who among us cannot relate? Who hasn’t found themselves face to face with a lover or a mourning friend, at one of those times when words fail and yet words are all we have? el color del tiempo en una muro abandonado. the color of time on a ruined wall. In my eyes I’ve lost everything. Asking is so far away. And so close, this knowledge of want. Pizarnik’s history and poetic practice lend some credence to Aira’s assertion that she spent the last decade of her life engaged in a very demanding game. But you would not know any of this from reading this collection, which comes unencumbered by an introduction or any biographical apparatus aside from the usual back-cover adumbration. The absence of an introduction is interesting in part because the book is (and is touted as) a lamentably belated debut in English of a poet revered throughout the Americas and beyond, but also because the myth of Alejandra Pizarnik’s life has often overshadowed the poems themselves. Pizarnik appears at turns as the tortured artist, the romantically belated poète maudit, “the greatest and hence the last [poet],” the suicide, the soul sister of Unica Zürn, Clarice Lispector, Leonora Carrington, Remedios Varo, Sylvia Plath. The myth is intelligible in a way that the work actively resists. The absence of an introduction will be a boon to new English readers, I think, for they will not be primed to read Pizarnik’s collected poems as, in the words of one particularly tin-hearted North American academic, her “suicide obra.” Nothing has colored the reception of Pizarnik’s work more than her death by her own hand. Note, for instance, how Music and Literature translated the title of Enrique Vila-Matas’s remembrance of Pizarnik, “La poeta que lloró hasta romperse” (“The poet who cried until she broke”), as “An Overdose of Seconal.” The poet is lost in the suicide that took the living woman, a double loss and doubly regrettable. For many who have never been afflicted by depression, an artist’s suicide can lend her work an aura of authenticity, a retrospective deep pathos and exoticism that turns escape from an implacable foe into an adventure, the failure of flight into a successful quest. After suicide, the mind that persecuted itself mercilessly is venerated, as if the profound self-estrangement of depression left the artist free to serve as a vessel for the revelation of art, truth, or whatnot. And yet, the prospect of suicide — and particularly the sensation of being hunted and harried by oneself — is an overwhelmingly recurrent theme in Pizarnik’s poems, letters, and magnificent diaries. Quiero existir más allá de mi misma: con los aparecidos. Quiero existir como lo que soy: una idea fija. Quiero ladrar, no alabar el silencio del espacio al que se nace. I want to exist beyond myself: with the embodied ones. I want to exist as what I am: as a fixed idea. I want to bark, instead of praising the silence of the space you’re born into. So much desire made so implacable by the human problem of being an embodied idea. How to reconcile, how to escape, if not by suicide? Rimbaud’s systematic derangement of the senses did not fit her, nor did the surrealists’ games of hide-and-go-seek with rationality. Some find dissolution of the self in drink and drugs, mescaline for Michaux, others in sensual pleasure or in violence. Pizarnik found her answer in language itself. The cruelty of this irony was not lost on her. and put out the furies of my elemental body. The ambiguity of the first line, emphasized in Yvette Siegert’s translation, is typical of Pizarnik: does she want to hide from the battle she wages against language, or is it with words she hopes to hide herself? Of course it is both, which turns the epigraph from Quevedo into an ironic, mocking motto against which the last line of the couplet demands to be read. The problem refuses resolution. Pizarnik called her 1969 collection Nombres y figuras: aproximaciones (Names and Figures: Approximations). Published by her friend Antonio Beneyto, proprietor of the legendary Barcelona press La Esquina, the title reflects an understanding of her finished works as “‘approximations’ (in the sense that poems are approximations to Poetry).” This “Poetry” was, for Pizarnik, not genre but praxis, a process of losing oneself in the openness and possibility of composition. The finished poems that mark the end of this becoming stand as fossils or epitaphs to “Poetry”; they rebuke it at the same time they share it with the reader. Pizarnik’s “Poetry” reflects a forced ethics grounded in the willful loss of the self, of staying lost as long as possible, until it is too late. As Paul Valéry put it: “Poets enter the enchanted forest of Language with the express purpose of getting lost, getting high on being lost, looking for crossroads of significance, unforeseen echoes, stranger encounters; they fear neither detours, nor surprises, nor the dark.” It’s hard to imagine these dangers frightening the poet who sought time after time to remember her body in the night of the poem. In fact, one gets the sense that as she walked in circles over the same worn paths of image, phrase, and silence again and again, what Pizarnik feared most was finding herself once again in a squalid room far from home, or in an Argentine hospital, shivering. This is not to say, however, that poetry was a practice of psychological self-care for her, or that losing oneself necessarily means a retreat from others. She wanted to be published, she wanted to be recognized as a peer of the men she admired, and when she saw her finished poems she saw that they were marvelous, if still only approximations. The danger here is that surely she would have found it unconscionably sentimental to paper over the irony and contradiction at the heart of her endeavor. There is no promise of transcendence in getting lost here, no escape. Even so, Pizarnik’s relationship to poetry becomes most vital when she pursues the idea of losing herself in the poetic act. In this light, the method of composition for which she was known in Paris — constantly working and reworking on the chalkboard up until the moment when the poem revealed itself as hopelessly complete — becomes endearingly pathetic and serves as an important rejoinder to the poets (and their schools) with whom Pizarnik is typically lumped. Her work at once affirms the surrealist emphasis on process but rejects their reification of this process in the instantly finished poem; next to her poems, much surrealist production appears as mere procedure or technique. Pizarnik also makes the surrealist belief in the superior reality of the unconscious seem naïve and misguided insofar as it ignored the equally strange depths of the conscious, rational mind — the horrible “I.” And yet, by privileging the exceptional human value of the poetic process, her work also rebukes the modernist poets she admired who valued the artifact above all else: the objective, the independent, the eternal — and therefore the inhuman — poem. In Pizarnik’s poems, language is necessarily indeterminate, untrustworthy, and other. A perfect poem spells failure for the writer who had begun in hopes of losing or hiding herself, since it reveals and fixes her. The irony of hiding oneself in language is everywhere on display. Conozco la gama de los miedos y ese comenzar a cantar despacito en el desfiladero que reconduce hacia mi desconocida que soy, mi emigrante de sí. Escribo contra el miedo. Contra el viento con garras que se aloja en mi respiración. I’m familiar with the full range of fear. I know what it’s like to start singing and to set off slowly through the narrow mountain pass that leads back to the stranger in me, to my own emigrant. I write to ward off fear and the clawing wind that lodges in my throat. “Paths of the Mirror” likewise presents that recurrent failure, how the thing in which she has sought salvation — language — is built to fail. Mi caída sin fin a mi caída sin fin en donde nadie me aguardó pues al mirar quién me aguardaba no vi otra cosa a mí misma. The pleasure of losing yourself in the image foreseen. I rose from my body and went out in search of who I am. A pilgrim of my self [or from my self; the Spanish is ambiguous], I have gone to the one who sleeps in the winds of her country. My fall that is endless into my fall that is endless, where no one expected me, since when I looked to see who expected me, I saw no other thing than my self. Something falling in the silence. My final word was I, but by this I meant the luminous dawn. Note how her final word is that which she had meant to escape, herself, mistranslated by her own tongue, and then let that last line strike you like a gong. The inner life captured here, luminescing beneath the frozen surface of the verse, is typical of Pizarnik’s work. It is everywhere in the original Spanish and found often enough in Yvette Siegert’s translation. This living quality might account for some of Pizarnik’s elevated legacy in Latin America, a continent with a history of both disappearances and an insistence on life heroic in the face of its impossibility. (“Alive they were taken from us,” chant the bereaved at the gates of power, “and alive we want them returned.”) It also might have something to do with the fact that she is less well loved beyond the Spanish-speaking world, given just how hard this quality is to convey in translation. So much of the irony, the ambiguity, and the playfulness of Pizarnik’s language does not — and, in all fairness, probably cannot — survive its translation into English. Siegert’s translations are the best available in English. And yet, on my first pass through the book, I was caught up short in a number of places. I made notes of what I thought were errors of poetic judgment, as well as feats of imagination and identification, successes of the translator’s art (of which there are many; see “The Truth about this Old Wall” above for an indication of the difficulty of this task and a testament to Siegert’s skill). This, I thought, was part of the reviewer’s job, though the shots I planned on taking seemed unfair and unearned, especially given the impossible task and noble endeavor every translator undertakes. But later it occurred to me that there might be a sense in which Pizarnik’s work is best read in translation, or rather in a bilingual edition like this one, Spanish verso, English recto. In this format you can see how the verse strays and homes, how it staggers around the same ideas and images. English readers can watch the poems as they fret and perform their insecurity as they reflect the poet’s obsessions and the poignant absurdity of her calling. The bilingual presentation of each poem seems to hold open the promise of an ample country of solace to be found in the infinite possibility of language. Translation might be, as it is sometimes said, a betrayal, though here it seems like in its betrayal it achieves a greater fidelity of spirit. The beating heart of even Pizarnik’s most surreal works is a kind of reality — though of course not realism, that set of conventions which mimics and often cannot help but mock the real as it is lived — that might best be captured through a sense of “fidelity.” More real than realistic, Pizarnik’s poems persist as traces of the artist’s life, which overbrims but cannot outlive them. 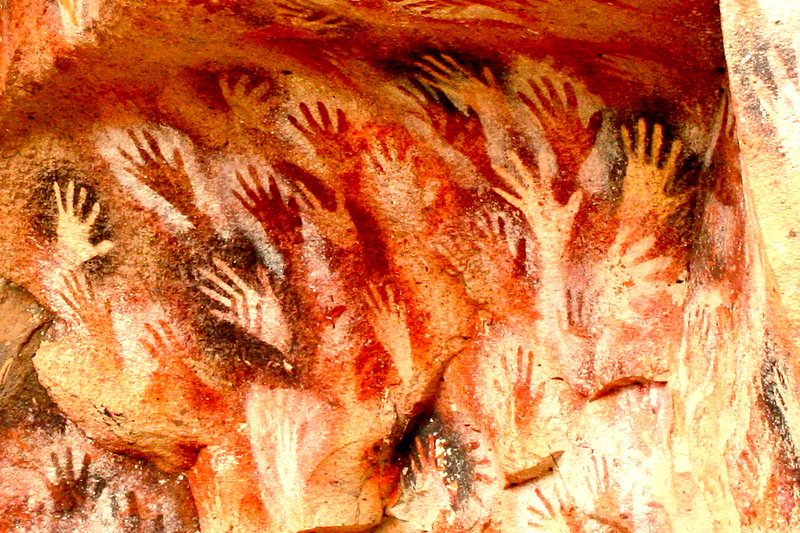 They are like the handprint paintings in La Cueva de las Manos in her native Argentina, where more than 9,000 years ago, human beings — mostly women, we are told — covered the cave walls in negative images of their hands by putting their palms against the rock and covering them with pigment blown though a tube made of bone or reed. Extracting the Stone reads like a similarly flash-frozen process. An exceptional human life evident in the exquisite poetry of its absence. and you are not able. Sing as if nothing were wrong. Lowry Pressly is a writer of fiction and cultural criticism.